Experienced wedding magician available for champagne receptions, photo calls and post wedding breakfast cabaret shows. Make your wedding the one they'll all remember! If you're reading this, you're probably getting stuck into organising your special day by now. If you haven't already, you'll find out very quickly that there's an awful lot more to organise than you may have first expected. When you're having fun with all of the above, It's very easy to forget some very important things such as planning for UK weather, making sure there are enough vegetarian/vegan food options, organising plenty of soft drinks for guests that are driving, keeping everything on time and finding a way to stop your guests getting bored while you're off having your photographs taken. 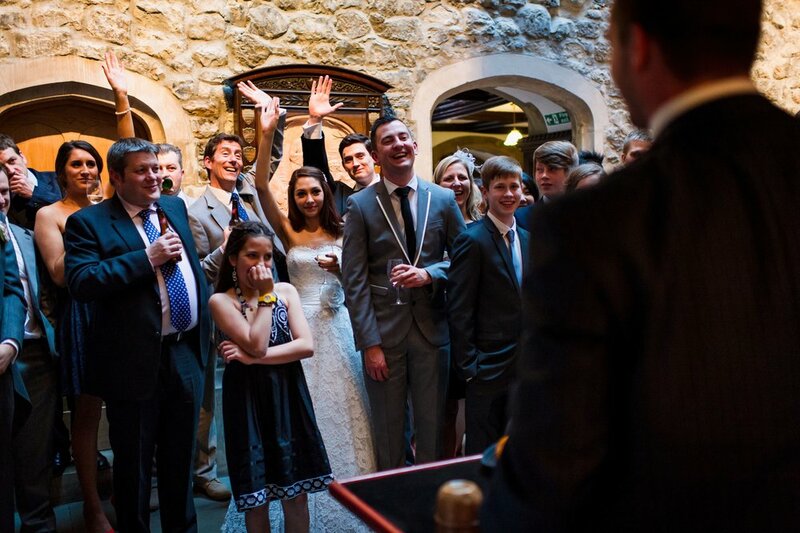 Keep your guests entertained and amazed with close up magic while you have the photos taken. A comedy show is the ideal way to get your guest laughing hysterically and re energised after the wedding breakfast. While guests are being seated I'll come and perform some personal magic effects just for the two of you as you wait outside. Guests not being seated quickly can upset the entire itinerary but more importantly it leaves you both waiting around outside, before making your first entrance as a married couple. My show is fully interactive and sure to have your guests talking about it for months and even years after your wedding day. This is the perfect time for me to perform a comedy cabaret show to shake things up a little. The show is packed with intelligent humour and plenty of audience participation. My performance will leave your guests excited and energised, ready to enjoy the rest of your special day with you. It also means the staff can get on with turning the room around for the evening proceedings. No stage needed, my show can be performed inside and out. With over 12 years experience as a wedding magician, I've performed at literally hundreds of weddings and have seen what works and what doesn't. Keep guests in their seats throughout the meal. Seamlessly bridges the wait between courses whilst other tables finish eating. A specially Personalised Top Table Mini Show for the bride and groom with a mind blowing ending that leaves the wedding couple with a unique, personalised wedding gift they can treasure forever. At this stage, the most important thing is to secure your special date in order to avoid disappointment, as dates get booked up very quickly and are strictly on a first come first served basis. To hold your date please click the button below.